The Eye of Horus personified in the goddess Wadjet also written as Wedjat,Uadjet, Wedjoyet, Edjo or Uto and as The Eye of Ra or "Udjat" is an ancient Egyptian symbol of protection and royal power. The name Wadjet is derived from ‘wadj’ meaning ‘green’ hence ‘the green one’ and was known to the Greeks and Romans as ‘uraeus’ from the Egyptian ‘iaret’ meaning ‘risen one’ from the image of a cobra rising up in protection. Wadjet was one of the earliest of Egyptian deities who later became associated with other goddesses such as Bast, Mut, and Hathor. She was the tutelary deity of Lower Egypt and the major Delta shrine the ‘per-nu’ was under her protection. Hathor is also depicted with this eye. 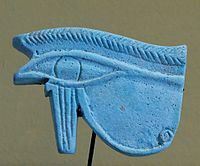 Funerary amulets were often made in the shape of the Eye of Horus. The Wedjat or Eye of Horus is "the central element" of seven "gold, faience,carnelian and lapis lazuli" bracelets found on the mummy of Shoshenq II. The Wedjat "was intended to protect the king [here] in the afterlife" and to ward off evil. Ancient Egyptian and Near Eastern sailors would frequently paint the symbol on the bow of their vessel to ensure safe sea travel. Horus was the ancient Egyptian sky god who was usually depicted as a falcon. His right eye was associated with the sun Ra. The eye symbol represents the marking around a Peregrine Falcon‘s eye that includes the "teardrop" marking sometimes found below the eye. 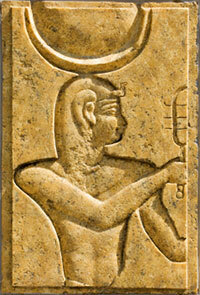 The mirror image, or left eye, sometimes represented the moon and the god Djehuti (Thoth). 1/2 was represented by smell, symbolized by the right side of the eye in a form of the nose. The pyramid text says: "Behold [the fire] rises in Abydos and it comes; I cause it to come, the Eye of Horus. It is set in order upon thy brow, O Osiris Khenti-Amenti; it is set in the shrine and rises on thy brow." 1/4 was represented by sight or the sensation of light, symbolized by the pupil. The pyramid text says: "Perfect is the Eye of Horus. I have delivered the Eye of Horus, the shining one, the ornament of the Eye of Ra, the Father of the Gods." 1/8 was represented by thought, symbolized by the eyebrow. The pyramid text says: "…the Eye of Horus hath made me holy…I will hide myself among you, O ye stars which are imperishable. My brow is the brow of Ra." 1/16 was represented by hearing, symbolized by the left side of the eye in the form of an arrow pointing towards the ear. The pyramid text says: "That which has been shut fast/dead hath been opened by the command of the Eye of Horus, which hath delivered me. Established are the beauties on the forehead of Ra." 1/32 was represented by taste, by the sprouting of wheat or grain from the planted stalk, symbolized by a curved tail. The pyramid text says: "Come, the Eye of Horus hath delivered for me my soul, my ornaments are established on the brow of Ra. Light is on the faces of those who are in the members of Osiris." 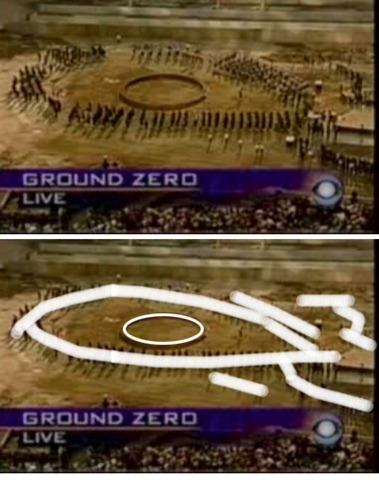 1/64 was represented by touch, symbolized by a leg touching the ground, or what can also be thought of as a strong plant growing into the surface of the earth. The pyramid text says: "I shall see the Gods and the Eye of Horus burning with fire before my eyes!" ^ M. Stokstad, "Art History"
^ Alessandro Bongioanni & Maria Croce (ed. ), The Treasures of Ancient Egypt: From the Egyptian Museum in Cairo, Universe Publishing, a division of Ruzzoli Publications Inc., 2003. p.622. 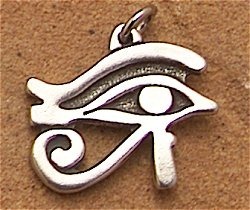 According to the editors, ‘Udjat’ was the term for amulets which used the Eye of Horus design. ^ "?". Retrieved 24 August 2010. A Christian version of the Eye of Providence, emphasizing the triangle representing the Trinity. 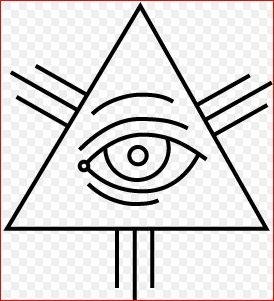 The Eye of Providence, or the all-seeing eye of God, is a symbol showing an eye often surrounded by rays of light or a glory and usually enclosed by a triangle. It is sometimes interpreted as representing the eye of God watching over humankind. (see Divine Providence). 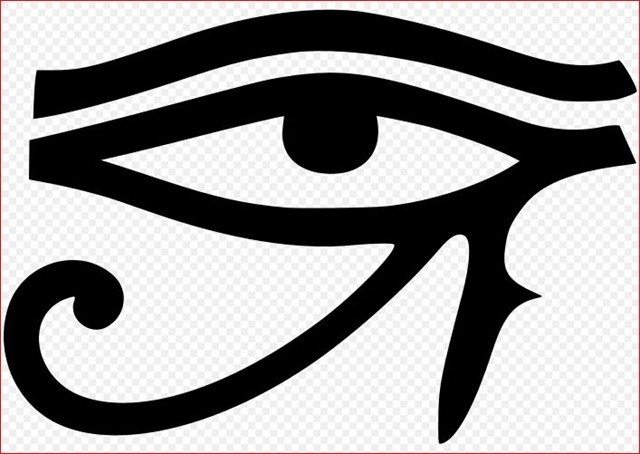 Imagery of an all-seeing eye can be traced back to Egyptian mythology and the Eye of Horus. It also appears in Buddhism, where Buddha is also regularly referred to as the "Eye of the World" throughout Buddhist scriptures (e.g. Mahaparinibbana Sutta) and is represented as a trinity in the shape of a triangle known as the Tiratna, or Triple Gem. 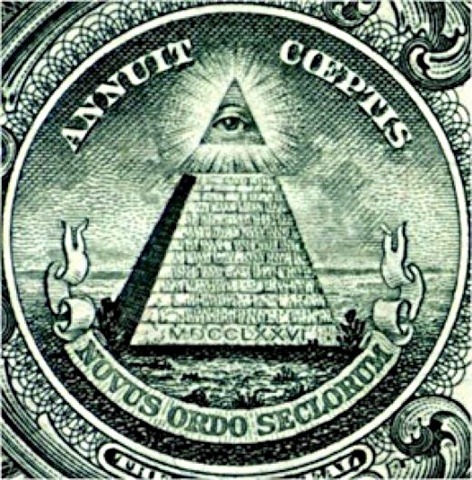 On the seal, the Eye is surrounded by the words Annuit Cœptis, meaning "He approves (or has approved) [our] undertakings", and Novus Ordo Seclorum, meaning "New Order of the Ages". The Eye is positioned above an unfinished pyramid with thirteen steps, representing the original thirteen states and the future growth of the country. The lowest level of the pyramid shows the year 1776 in Roman numerals. The combined implication is that the Eye, or God, favors the prosperity of the United States. 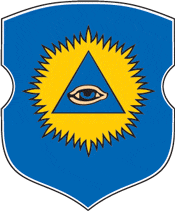 Perhaps due to its use in the design of the Great Seal, the Eye has made its way into other American seals and logos, notably the Seal of Colorado and DARPA‘s Information Awareness Office. 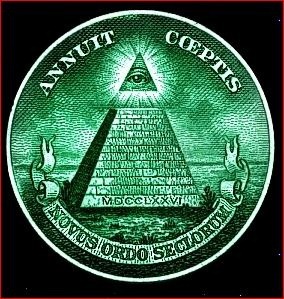 Today, the Eye of Providence is usually associated with Freemasonry. 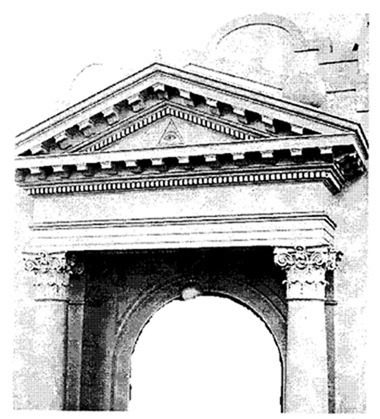 The Eye first appeared as part of the standard iconography of the Freemasons in 1797, with the publication of Thomas Smith Webb‘s Freemasons Monitor. 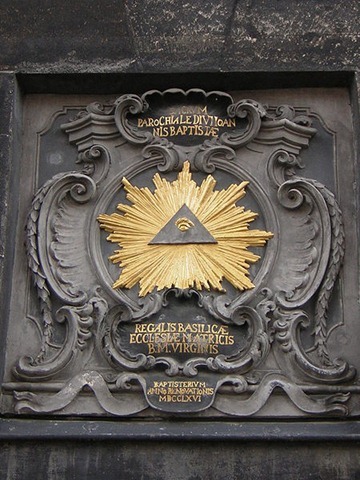 Here, it represents the all-seeing eye of God and is a reminder that a Mason’s thoughts and deeds are always observed by God (who is referred to in Masonry as the Great Architect of the Universe). 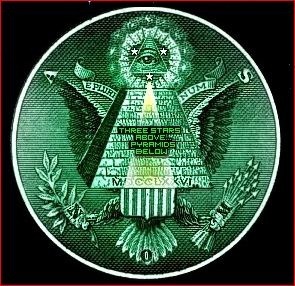 Typically, the Masonic Eye of Providence has a semi-circular glory below the eye. Sometimes the Eye is enclosed by a triangle. The coats of arms of Braslaw,Belarus. 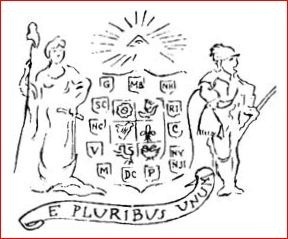 Several college fraternities use the Eye of Providence in their coats of arms and/or badges, notably Delta Tau Delta, Phi Kappa Psi, Phi Delta Theta and Delta Kappa Epsilon. The seal of The University of Mississippi. Musical artists MC5 and Roky Erickson used the Eye of Providence as a logo at many occasions. Eye of Horus, son of the chief deity of the ancient Egyptians. An alchemical woodcut showing the all-seeing eye of God floating in the sky. 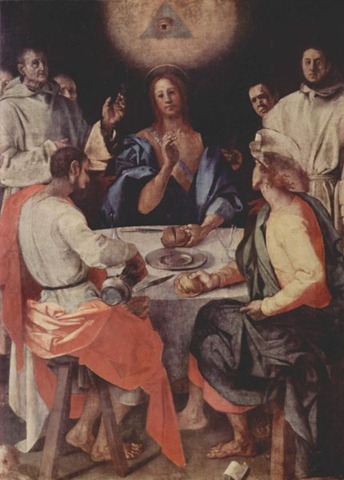 A 1525 Jacopo Pontormopainting using the Eye of Providence in a triangle as a symbol of the Christian Trinity. An all-seeing eye that appears on the tower ofAachen Cathedral. 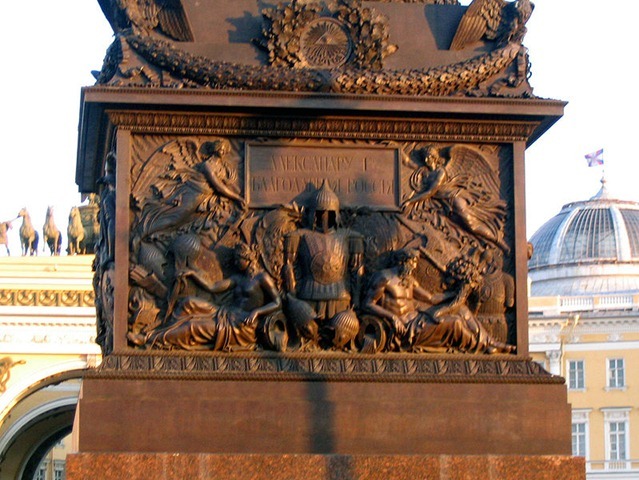 An all-seeing eye that appears on the pedestal decorations of Alexander Column. 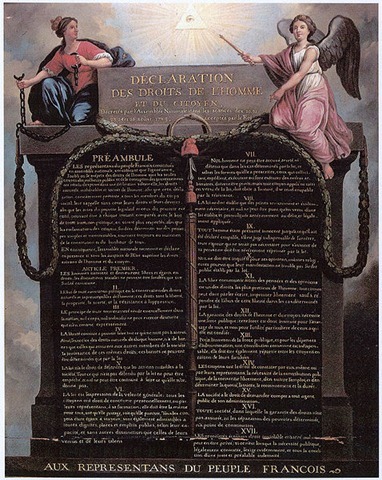 An all-seeing eye that appears on the top of Declaration of Human Rights (1789), French Revolution. An all-seeing eye that appears in a triangle at the facade of an Esoteric Christian Temple (1920),Mount Ecclesia. Horus was an ancient a sky god whose eyes were said to be the sun and the moon. However, he soon became strongly associated with the sun (and the sun god Ra as Ra-Horakhty ("Ra, who is Horus of the two horizons") while Thoth was associated with the moon. An ancient myth describes a battle between Horus and Set in which Horus´ right eye was torn out and Set lost his testicles! Thoth magically restored Horus´ eye, at which point it was given the name "Wadjet" ("whole" or "healthy"). In this myth it is specifically stated that it is Horus´ left eye which has been torn out, so the myth relates to the waxing and waning of the moon during which the moon appears to have been torn out of the sky before being restored once every lunar month. There are a number of depictions of the restoration of the eye in Greco-Roman temples. Thoth is assisted by fourteen gods including the gods of the Ennead of Hermopolis or thirty male deities (in Ismant el-Kharab, the Dakhla Oasis). Each god represented one of the fifteen days leading up to the full moon, and to the waning moon. The restored eye became emblematic of the re-establishment of order from chaos, thus closely associating it with the idea of Ma´at. In one myth Horus made a gift of the eye to Osiris to help him rule the netherworld. Osiris ate the eye and was restored to life. As a result, it became a symbol of life and resurrection. Offerings are sometimes called "the Eye of Horus" because it was thought that the goods offered became divine when presented to a god. The Eye of Horus was believed to have healing and protective power, and it was used as a protective amulet. It was also used as a notation of measurement, particularly for measuring the ingredients in medicines and pigments. The symbol was divided into six parts, representing the shattering of Horus´ eye into six pieces. Each piece was associated with one of the six senses and a specific fraction. More complex fractions were created by adding the symbols together. It is interesting to note that if the pieces are added together the total is 63/64 not 1. Some suggest that the remaining 1/64 represents the magic used byThoth to restore the eye, while others consider that the missing piece represented the fact that perfection was not possible. 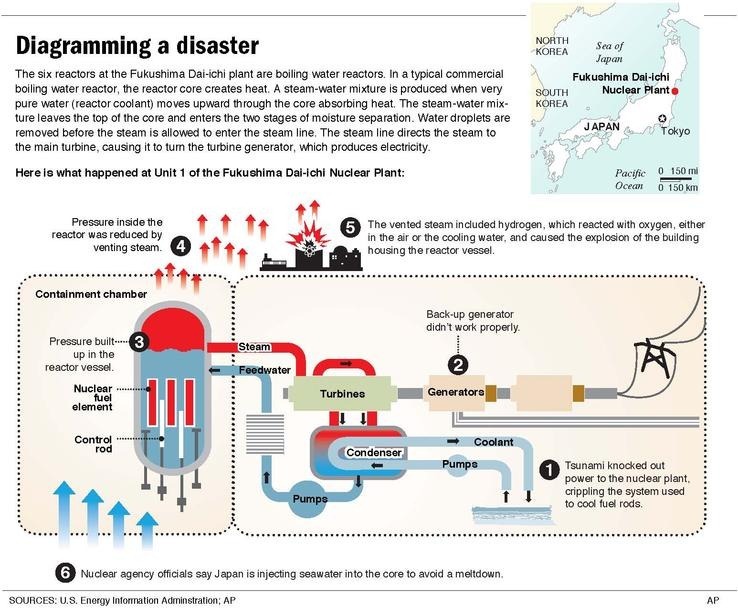 However, it is equally likely that they appreciated the simplicity of the system which allowed them to deal with common fractions quickly, after all they already had a symbol for the number "1" and they had other numerical notations available when they needed to use smaller fractions. 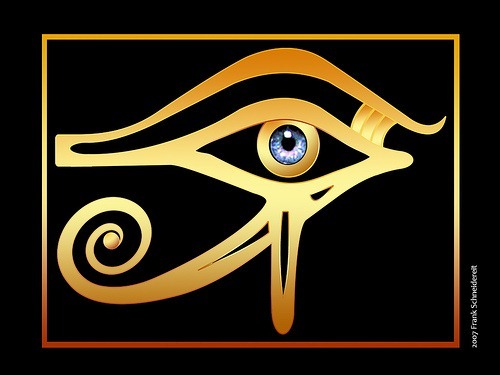 According to later traditions, the right eye represented the sun and so is called the "Eye of Ra" while the left represented the moon and was known as the "eye of Horus" (although it was also associated with Thoth). 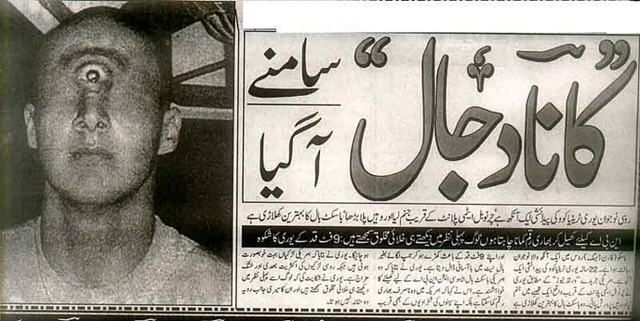 However, in many cases it is not clear whether it is the left or right eye which is referred to. Others myths suggest that it is Horus´ right eye which was torn out and that the myth refers to a solar eclipse in which the sun is momentarily blotted from the sky. According to one myth, Ra (who was at that point the actual Pharaoh of Egypt) was becoming old and weak and the people no longer respected him or his rule. They broke the laws and made jokes at his expense. He did not react well to this and decided to punish mankind by sending an aspect of his daughter, the Eye of Ra. He plucked her from the Ureas (royal serpent) on his brow, and sent her to earth in the form of a lion. She waged war on humanity slaughtering thousands until the fields were awash with human blood. When Ra saw the extent of the devestation he relented and called his daughter back to his side, fearing that she would kill everyone. However, she was in a blood lust and ignored his pleas. So he arranged for 7,000 jugs of beer and pomegranate juice (which stained the beer blood red) to be poured all over the fields around her. She gorged on the "blood" and became so drunk that she slept for three days and awoke with a terrible hangover. Thus mankind was saved from her terrible vengeance. There are a number of different versions of the myth, and a number of goddesses are given the title "Eye of Ra", in particular Hathor, Sekhmet, Tefnut, Bast, Mut, Nekhbet and Wadjet . The "Daughter of Ra" was sometimes symbolised as a Cat who protected Ra from the serpent Apep (linking it with the leonine aspects of Hathor, Bast, Sekhmet, Tefnut,Mut, Nekhbet and Wadjet amongst others). The Cat was also thought to be able to cure and scorpion or snake bite and was associated with the goddesses Isis (although she is only linked to the symbol in its protective function). Similar to the Eye of Horus, the Eye of Ra is one of the most ancient magical symbols. Also called the udjat, the Eye of Ra is sometimes invoked as a sigil of protection. The symbolism of eyes appears in many different cultures and civilizations — it’s no surprise that the image of an "all-seeing eye" is common in today’s society! In Reiki, the eye is often associated with knowledge and enlightenment — the Third Eye — and it typically is connected to the true soul. The eye symbol was painted on the boats of Egyptian fishermen before they set out to cast their nets along the Nile River. This protected the boat from evil curses, and its occupants from those who might wish them harm. The Egyptians also marked this symbol on coffins, so that the person held within would be protected in the afterlife. In the Book of the Dead, the dead are led into the afterlife by Osiris, who offers the deceased soul nourishment from the Eye of Ra. The notion of the "evil eye" is a universal one. Ancient Babylonian texts make reference to this, and indicate that even 5,000 years ago, people were trying to protect themselves from the malevolent thoughts of others. Use this symbol as one of protection against someone who might harm you or your loved ones. Invoke it around your property, or wear it on a talisman or amulet as a protective device. 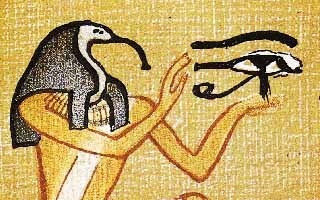 According to legend, the left eye was torn from Horus by his murderous brother Seth, and magically restored by Thoth, the God of magick. After the restoration, some stories state, Horus made a gift of the eye to Osiris, which allowed this solar deity to rule the underworld. The story of this injury is probably an allusion to the phases of the moon as the eye which is “torn out” every month. 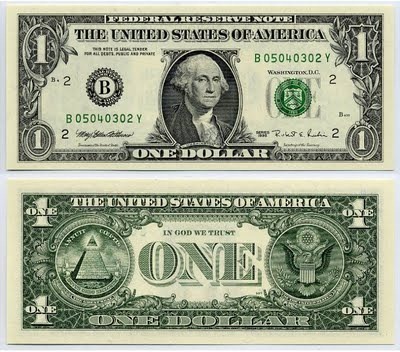 The Masonic all seeing eye, the Eye of Providence symbol found on American money, and our modern Rx pharmaceutical symbol are all descended from the Eye of Horus. Ra is the Sun God of Egypt. Many people call him “rah” but the correct pronunciation is “ray” (that’s why his name is also written as “Re”). He is considered the father of Gods, and was the most important and worshipped king of Gods. Ra is usually depicted with the body of a human and thehead of a falcon. Ra’s wife is called Ratet and his daughter Hathor, aka Eye of Ra. The sun was first worshipped as Horus, later as Ra. He is associated with the mid-day sun (other deities represent other positions of the sun). This is why sun deities were very important in ancient Egypt. Ra bore several other offspring; amongst those was his son, the king. Ra embodies the Egyptian beliefs of order and truth. Ra is perpetually resurrected in the mornings, he rides across the sky during the day and at sunset he is swallowed by the goddess Nut, only for her to give birth to him in the morning. The most common symbol associated with the ancient Egyptian God Ra is the sun. He is depicted in a wealth of symbols, but they all are formed around the theory of Ra representing creation and nature. Most of his symbols were shared with other solar deities, mainly Horus. In Egyptian art, Ra is usually seen as a man with a pharaoh’s crown on his head and a sun disk above it. Ra is often depicted with a falcon head, just like Horus. The winged sun disk: the primary symbol of Ra, a very ancient symbol that signifies the “Sun of Righteousness with healing in his arms.” It also represents the creative elements of nature. 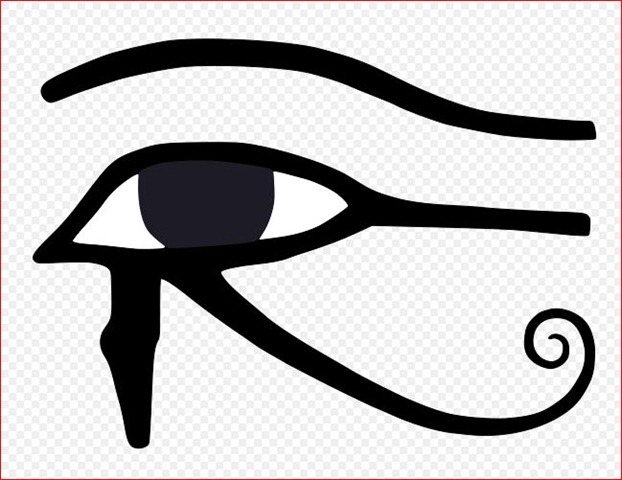 Wedjat: (aka utchat, eye of Ra, eye of Horus) is a sacred eye symbol (see below). Phoenix: Ra rose in the shape of a phoenix from the primordial ocean of Nun and landed on a single mound of dry land and then let the sun’s rays shine forth. Lotus Flower: Ra formed himself from the chaos of Nun and emerged from the lotus petals. The ancient Egyptians have numerous Gods in there culture and they feel that the Gods walk among them, invisibly on Earth. Ra is the most central God of the Egyptian Pantheon and doesn’t dwell on earth, but watches his children and kingdom from the sky. At sunrise, Ra is a young boy called Khepri, mid-day he becomes the falcon-headed man and at sunset he becomes an elder called Atum. He travels in a sun boat and had to be defended against Apep, a giant serpent that tries to eat the sun boat every night. Ra changed greatly over the course of ancient Egyptian history. In dynastic times he was merged with Horus and became Re-Horakhty. He then ruled over sky, earth and underworld and was the creator of the world. Ra developed through the second and fifth dynasty. In the fourth dynasty, pharaohswere known as "sons of Ra". Ra was upheld the most in the fifth dynasty, where he became more associated with the king then the pharaoh. Kings erected pyramids that were considered solar temples and aligned them with the rising and setting sun in his honor. During the Middle Kingdom, Ra was more and more combined with other deities like Osiris and Amun. In the New Kingdom, Ra became more and more popular, which resulted in a kind of monotheism. The worship of Ra as a religious and cultural figure has significantly deteriorated over years due to the rise of christianity. The name has changed over generations but the meaning is still the same. The Eye of Ra was once known as the Eye of Horus or Wedjat. It is an ancient Egyptian symbol of protection and thedivine royal power. It is a powerful force that is linked with the fierce heat of the sun and was passed on to each Pharaoh. The Eye is considered the all-seeing eye and protects the king and thwart off evil. This Egyptian symbol appears on the Great Seal of the United States, and on every United States dollar bill. 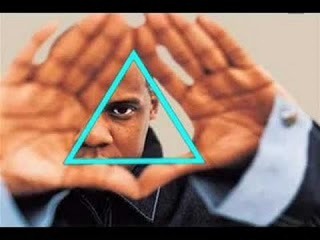 The eye within the pyramid represents Ra awaiting rebirth. Even though he is enclosed in the pyramid his soul remained alive and watchful, as indicated by the open eye. The ancient pyramid texts state: Perfect is the Eye of Horus. I have delivered the Eye of Horus, the shining one, the ornament of the Eye of Ra, the Father of the Gods."